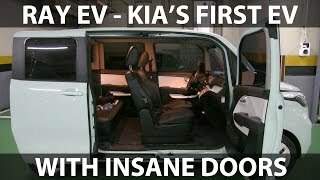 Kia introduced Korea’s first electric vehicle today (Thursday), with the launch of the new Kia Ray EV – a zero-emissions city car with lively performance and a range of up to 139 km (86 miles) on a single charge. The front-wheel drive Ray EV is powered by a 50kW electric motor and a high-capacity 16.4 kWh lithium ion polymer battery pack that is engineered for a 10-year life cycle and skillfully packaged under the rear seat and cabin floor. 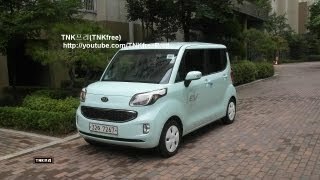 (SEOUL) December 22, 2011 – Kia Motors introduced Korea’s first electric vehicle today (Thursday), with the launch of the new Kia Ray EV – a zero-emissions city car with lively performance and a range of up to 139 km (86 miles) on a single charge. For supply exclusively to the domestic Korean market, the Kia Ray EV is a close relative of Kia’s 1.0-liter gasoline powered Ray CUV, which went on sale in Korea last month. It shares that model’s major dimensions and, in a global first for an EV manufacturer, can share a production line with conventional combustion-engine cars. The front-wheel drive Ray EV is powered by a 50kW electric motor and a high-capacity 16.4 kWh lithium ion polymer battery pack that is engineered for a 10-year life cycle and skillfully packaged under the rear seat and cabin floor. 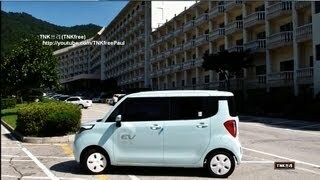 The Ray EV’s automatic transmission offers the driver a choice of two modes while in ‘D’ drive. ‘E’ (or ‘eco’) mode optimizes the delivery of the motor’s torque to achieve minimum battery consumption and maximum driving range. ‘B’ (or ‘brake’) mode can be selected when driving downhill on highways and on mountain roads to maximize braking power. Bearing the same striking exterior styling as its gasoline cousin, the Kia Ray EV has four small distinguishing points. A flap in the front radiator grille covers an electricity inlet for a 220V supply for the slow recharge mode, another inlet (for the fast recharge mode) is fitted in the same location as the fuel intake of the regular models, special decals on each front door proclaim the ‘Zero Emissions EV’ message and super-smooth 14-inch alloy wheels improve aerodynamic performance by minimizing drag. Inside, the Ray EV features a unique instrument cluster, displaying electric motor operation, battery status and distance to recharge. It is also equipped with the first-ever EV-specific navigation system that features a 7-inch screen and provides crucial information for EV drivers such as the nearest locations of the slow/fast recharging stations. The display shows a circular shaped area in which the model can travel with its current level of battery power, so that drivers can see which destinations are reachable without a recharge. The Kia Ray EV embodies numerous innovations. The electric motor achieves 93% efficiency, which is the best in its segment. The lithium ion polymer battery’s cell is optimized and highly integrated, which has enabled its weight to be reduced by 13% and its energy density to be increased by 15% compared to competitors’ systems. 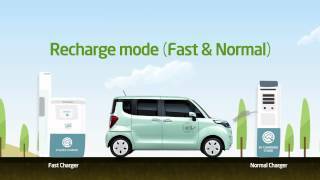 The on-board charger, current inverter, high-low voltage converter and EV-specific VCU (vehicle control unit) each features advances over previous equipment. 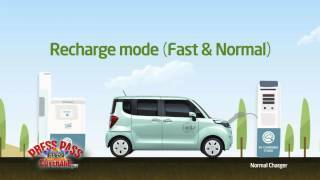 Ray EV is also equipped with a new type of regenerative braking system featuring an Active Hydraulic Booster that utilizes the electric motor, instead of the gasoline engine in the regular model, to create hydraulic pressure for the brake system. The result is consistent brake pedal force throughout a wide variety of driving conditions and the ability to harvest excess energy and use it to recharge the car’s battery. Japan and the USA are already considering the introduction of a legal requirement for EVs to have a virtual engine sound, and Kia has taken the first step to commercialize this system in order to anticipate the global industry’s trend. To ensure that the Ray EV is as safe as gasoline cars, it is equipped with six air-bags, and electronic stability features – VDC (Vehicle Dynamics Control) and HAC (Hill Assist Control, to prevent roll-back) – as standard. Additional Kia Ray EV images as well as other Kia related video, stills and other press material are available at Kia Motors’ Multimedia Library (http://kia.synapticdigital.com), powered by Synaptic Digital. Content is available in HD, broadcast, and streaming-quality formats, including PAL and NTSC, and can be downloaded utilizing the industry’s fastest download technology.